Annihilist Talks of Reissuing Debut EP, New Music Underway and Other Hobbies and Interests! Melodic death metal act ANNIHILIST have all new music in the works, but current plans are set for reissuing their debut EP, that was originally released sometime ago. Besides music, this band does have any forms of activity take place, such as gaming among other interests! The band goes into further talks about these matters! 1. Let’s get started by introducing ANNIHILIST to our readers. Who is ANNIHILIST and how did you guys get started? 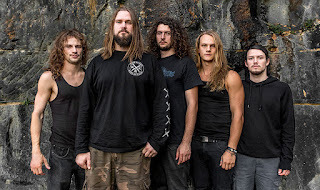 Annihilist are a melodic death metal band from Melbourne Australia. We formed in 2014 via the local music scene and going to shows. 2. What type of music does your band play and why should people care to check it out? We play our own brand of melodic death metal heavily influenced by progressive and "modern" metal. Annihilist’s music aims to fill a niche between the era where metal was fluid, dynamic, and "epic" in its musicality, with the very heavy and refined modern metal palates - creating something new we’d personally think is missing. 3. How did you come up with the band's name ANNIHILIST? Does the name have a meaning behind it? It’s a made up word, pronounced AH – NIGH – HIL- IST. We have our own interpretations of the band name, but in reality - we were after a name that sounded like a metal band. 4. Do you write your own songs? What are your songs about? Absolutely, we write all our own music. A common theme within our music is staying strong - keeping your chin up, and fighting through any hardship you may have within life and coming out better off on the other side. It’s about not letting something define you such as succumbing to an intense feeling such as rage or a past experience that’s taken a toll on you. It’s about knowing no matter how you feel, you can take control and you can live again. These ideologies are quite present amongst all of us with our own struggles in life, and we’ve all learned a positive outlook and proper drive can be what it takes to pull through. As individuals, our influences span across all sorts of music including every variety of heavy music. Some major influences on our particular style include Machine Head, DevilDriver, Animals As Leaders, Architects and many more. 6. You recently signed on with Truth Inc. Records, how did this occur and why did you want to be signed? Truth Inc. are an Australian based label and we are an Australian based band. We play a lot of shows and meet many people within the industry, so I think it was only a matter of time before both we and the label became aware of each other. We liked the idea of working with a company that put the same amount of passion into their work as we do with ours, and in turn grow with each other. 7. Your debut EP "Vol 1." was reissued by this label, but why was this so? We self-released Vol. 1 in 2015. Our limited amount of knowledge and resources on how to release music meant we didn’t quite reach the audience we would have liked to. We want people to hear and enjoy our music as much as we enjoy hearing and making it ourselves. With a label such as Truth Inc behind us, we felt we could reach a wider audience. 8. While this is "Vol. 1", will there be other accompanying volumes to follow? There might be! We haven’t quite decided yet. 9. Do you have any new music in the works at this current time? We have an entire full-length album in the works which we hope to have released sometime in the near future. 10. So besides music, what other sort of hobbies and interests does the band have or share together? Most of us enjoy playing video games. Some games we enjoy playing include Doom, Zelda, Mario and Mortal Kombat. We are all big fans of board games too! 11. How would you say that those hobbies and or interests relate to the music that this band creates and why? Playing board games together certainly helps us bond as a band and get to know each other better. This helps unwind during the song writing process. 12. Where do you hope to see yourself and the band in the next 5 years? We certainly hope to be touring internationally by then! Playing some of the big European metal festivals like Wacken and Brutal Assault is a dream of ours.